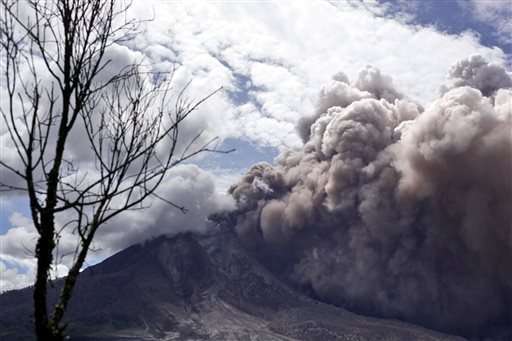 A volcano in western Indonesia unleashed a new powerful burst high into the sky on Saturday, sending hot ash far down the mountain's slopes, an official said. 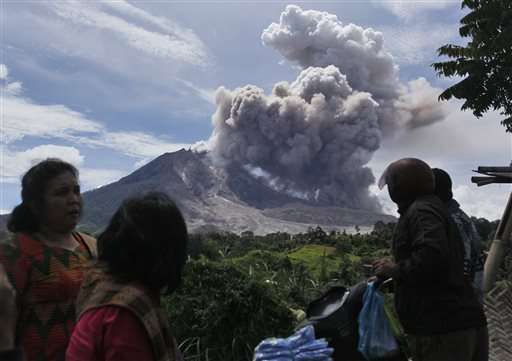 Authorities have been closely monitoring 2,460-meter (8,070-foot) -high Mount Sinabung on Sumatra, one of Indonesia's main islands, since June 2, when its status was raised to the highest alert level due to the growing size of its lava dome. Hot ash tumbled down the slopes of the mountain as far as 3 kilometers (2 miles) southeastward on Saturday, said Wendy Cahya, an official at the mountain's monitoring post. No injuries were reported from the latest eruption, he said. Cahya said that as of Saturday evening, 11 avalanches of hot ash had been recorded, with volcanic ash released as high as 2 kilometers (1.2 miles) into the air. Volcanologists have warned that smoldering rocks mixed with hot gases may tumble down from the mountain at any time. More than 2,700 people from villages within the danger zone of 7 kilometers (4.4 miles) from the crater have been evacuated to temporary shelters. No casualties have been reported from this month's eruptions. Mount Sinabung is among about 130 active volcanoes in Indonesia, which is prone to seismic upheaval due to its location on the Pacific "Ring of Fire," an arc of volcanoes and fault lines encircling the Pacific Basin. The volcano has sporadically erupted since 2010, after being dormant for 400 years. 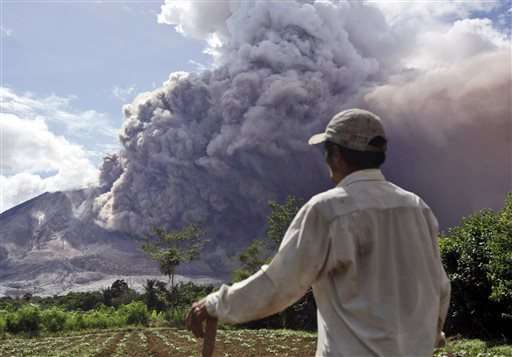 An eruption last year killed at least 17 people.